A latex mattress will be the most durable mattress you can get. So many claim to be latex, but are a combination, used as part of a layer, or are actually “latex like” foam – usually a type of memory foam. This is 100% latex and other organic materials like wool and cotton, and it has no flame retardants or synthetic additives. 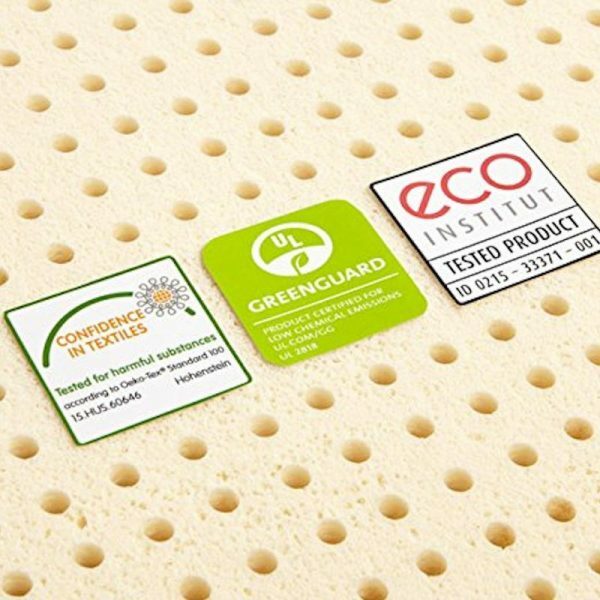 It is Oeko-Tex certified and updated yearly to make sure there are no heavy metals, phthalates or azo dyes, pesticides, and other similar chemicals. It is made with all natural components, very comfortable and durable. It is very high quality, one piece, and requires no assembly. 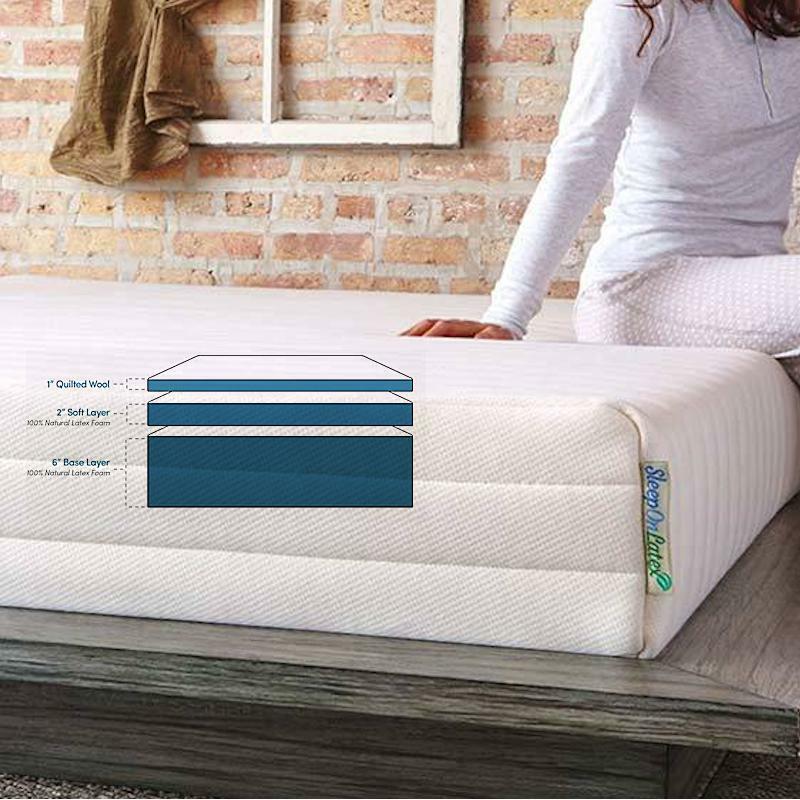 Natural latex offers elastic support that reduces pressure points better than other types of foam. The elasticity means it will instantly adjust to your posture and changing positions, while allowing and assist to changing positions so you don’t struggle against gravity. Natural latex is very durable, which means the support and comfort and will last longer than other types of foam. 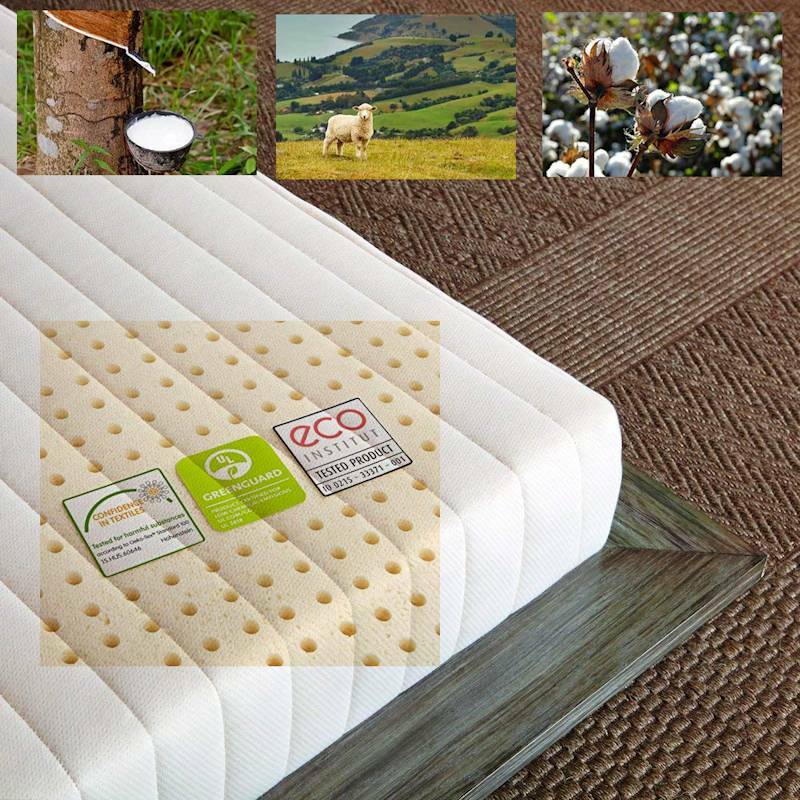 The construction uses small air chambers throughout the mattress to promote air circulation and helps to reduce weight. Latex is usually denser than other types of foam, so it can be heavier. 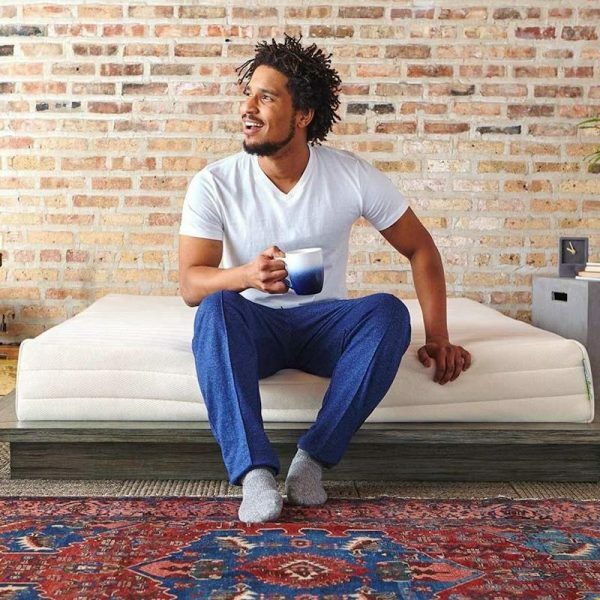 Additionally, the organic cotton and wool are very breathable materials that increases air circulation and a cooler night’s sleep. Variable firmness is controlled in the manufacturing process to allow custom support according to your needs. For side sleepers and those with shoulder or hips problems, the soft is recommended. In general, the medium is good for both back and side sleepers, while a firm is recommended for stomach sleepers or strict back sleepers. Dunlop latex is best used for mattresses due to the springy properties that help to guide you in changing positions. 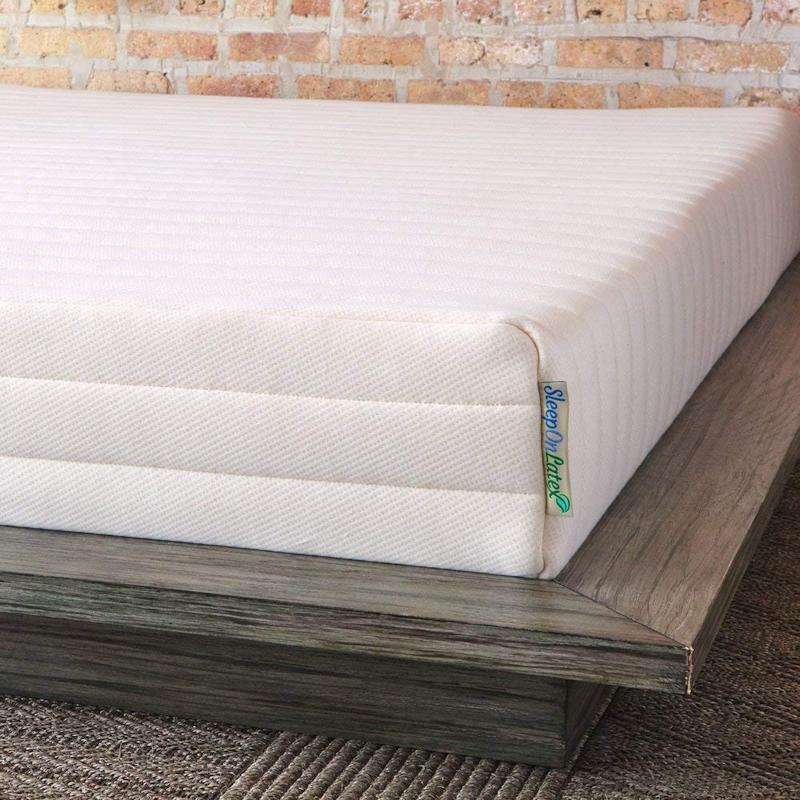 While maintaining a high level of comfort, it does not react slowly like memory foam that you will have to fight until it accommodates to your body. Latex is quick reacting. This particular company is rather unique in it’s approach. 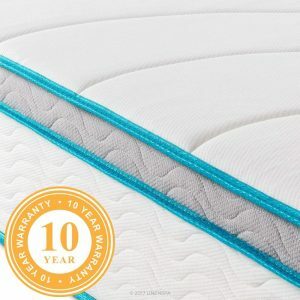 They design, sew, quilt, assemble, as well as package every mattress in their factory, allowing complete quality control in the process, which means a high quality product that is consistent. This consistency is very important, and I can’t stress this enough. If you like it and decide to purchase another, you want it to be the same and not to vary so much that it feels like a different mattress. The more remote the processes are, from design to packaging, the more likely the mattress will vary in consistency. I have had very bad experiences with this and admire the attention to detail along every process. 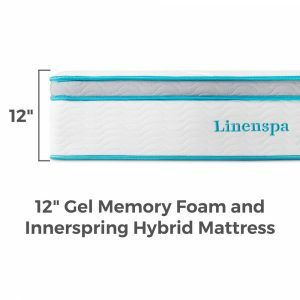 If you have every gone to a mattress store, tested one and then after purchasing, it feels different when you get it delivered, you can understand. This process is greatly magnified with online purchasing, and SleepOnLatex pays attention to details that can minimize being disappointed. Only the highest quality materials are used. The fabric is 100% organic cotton. 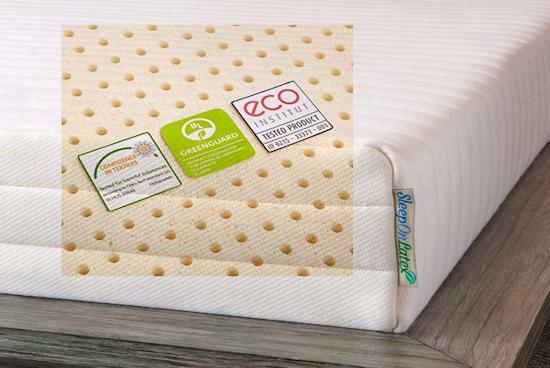 The foam is 100% natural latex, complying with the strictest health standards. There are no synthetics or fillers in the foam. The wool is 100% organic, and because wool offers a good fire barrier, it is not necessary to use barriers or fire retardant chemicals. You will feel this difference. 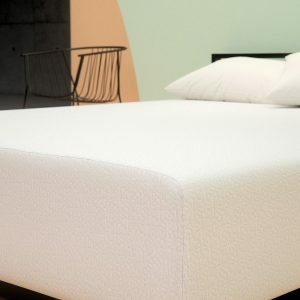 The mattress is 9 inches, using a 6 inch base latex layer covered by a 2 inch softer layer of latex and topped with a 1 inch layer of wool that is quilted into the mattress cover. The result is a supportive and comfortable mattress that you can sleep on with peace of mind as well as comfort. The latex does not contain any synthetic components. 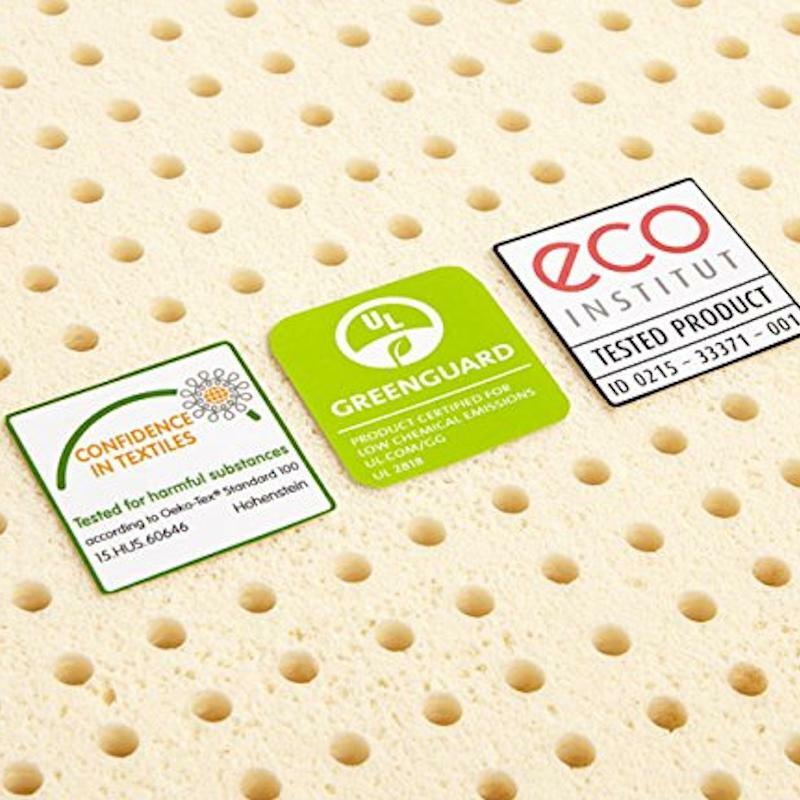 It is pure green foam developed in with a factory in Sri Lanka, certified for several international emissions standards, and engineered to the highest aesthetic and performance standards. The wool used is 100% organic New Zealand Wool for a great micro-climate. It has natural fire retardant properties and passes federal regulations without any fire retardant chemicals. Sourced from farms with highest humane animal standards with free range sheep. The wool meets requirements for toxicity and biodegradability. Latex is denser than other types of foam, so compared to other mattresses, it will weigh more. There is no assembly required, however, we suggest you have someone help you as they can weight about 75 pounds or more, depending on the size. Take the latex mattress out of the box, place on your frame or base, unroll the wrap, and it will spring to life! 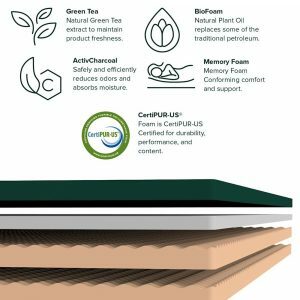 The latex mattress is compressed and rolled in a box for easy and less expensive shipping. Note: Firmness is a personal or subjective experience. In my experience, firm is very firm. The medium is firm, and the soft is the most giving, yet feels medium firm. My personal choice is the soft due to side sleeping with shoulder problems. A very nice mattress at a good price. There are cheaper ones and much more expensive ones. I think this is a very good value for a very good mattress, put out by a very good company; nice job!